Here’s the thing: for a guy who who write a weekly review article on comic books—for a guy who has a friggin’ comic book podcast—I read precious few comic books. Old stuff, sure! All the time. But modern stuff? So very, very little. After sorting through whatever book I can find in which Jubilee is currently being published, I seldom dig much deeper. Both Marvel and DC in their own ways have repeatedly annoyed me enough in the last decade that I can never get too attached to anything they regularly put out, and when it comes to independent books, unless they come with a strong recommendation, my leash for them is short. They don’t feature characters that I love and have grown up with, so it’s hard to form an immediate attachment to them. Not impossible, and I have done it, but it’s an uphill climb. But yeah, with DC I find they are far too willing to throw away the characters I have an affection for and make almost their entire universe about Clark, Bruce, Diana, Hal, and Barry. And with Marvel, they just put out awful “epic” event after awful “epic” event. After having stayed separate for a while in a Post-New52 DC Universe (and DC really has too many damn timelines. Remember when it was just Pre-Crisis and Post-Crisis? Those were the days), Barry and Wally are together again here. This story that starts with the Renegades—versions of the Flash’s Rogues villains from the 25th century—arriving to arrest Iris West and try her for the murder of Eobard Thwane. The war is teased as Wally impetuously runs off with Iris to save her while Barry is more willing to see what the Renegades’ plan entails. With Wally cooled down after a brief argument, they all travel to the 25th century, but Wally is snatched during the trip by Hunter Zolomon, the former Zoom. And I rejoice because I have always been a fan of this Zoom. Zoom is able to bring back Wally’s locked memories of the twins he had prior to Flashpoint, and he tells West that the twins can be saved if West breaks through the Speed Force. 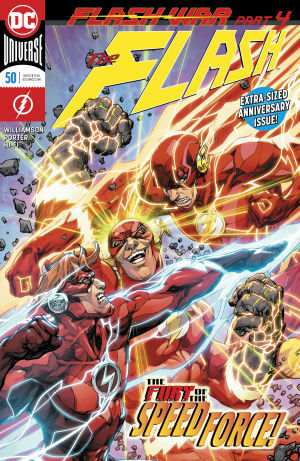 Barry finds this out and smells a trap, but Wally is overcome with grief for his lost children, and the Flash War is on! The Flashes fight as they run across the planet, basically ignoring or blowing through any defense or obstacle placed in their path, and characters from the reaches of the DC Universe start feeling the affects of the strain on the Speed Force. Eventually they break through the Force, but there is no Jai and Irey West waiting for them… just a newly empowered Zoom who now has access to the Strength Force and the Sage Force. Let’s start there. Back around 2007 or 2008, Geoff Johns had a brilliant idea to introduce Lantern Corps of the entire ROY G BIV spectrum to supplement the Green Lantern mythology. It would prove to be an overwhelmingly successful idea, as the concept of multiple Lantern Corps all based around a singular personality trait reignited those titles and introduced dozens of lasting, endearing characters. Flash War’s introduction of a Strength Force and a Sage Force feels like skirting around the idea of doing the same thing here. It’s too early to pass judgment yet, and honestly, nothing may come of this—outside of Zoom possessing some new abilities, not much is made of the Strength Force or Sage Force being aspects of reality that other characters tap into—but at its face, this feels like a fragile idea. If it’s not handled by a writer with a specific vision on how to introduce these forces and what their angle is, this could end up being a mess. And this is DC after all, so how long will it be before Superman just constantly accesses the Strength Force to punch all his enemies into submission. Beyond that, this story is all right. And that’s basically it; it’s “all right”. This doesn’t feel a great deal like the Wally West I know from Mark Waid and Geoff Johns’ runs on the character. And that’s fine because characters do grow and change, but this feels like a regression for him. He is a bit too tempestuous and pig-headed, especially when dealing with his hero, Barry. His reaction to the news about his twins—and his belief that Hunter could have become the friend he remembered again—is all right, but his running away with Iris and constant bickering with Allen just feel so out of place. Barry himself is a bit too clinical here and should have had a bigger emotional pull towards helping Wally find his kids. He comes across as barely caring about Jai and Irey being missing when he had such a big hand in their being erased from the current timeline. I don’t know… characters’ emotions are just all over the place here. Still, there is a HUGE plus I have neglected until now, and that is that the story concludes with BART ALLEN emerging from the speed force (wearing his Impulse outfit, which is a bit weird because Bart had given the up for years before his passing, but… whatever; DC did the same thing to Kyle Rayner when they stripped him of the white light and had him suddenly wearing his first costume because DC hates character growth). So it’s nice that Bart has returned to a DC timeline in which almost all of his friends are M.I.A., nonexistent, or just off in a corner, not being used. Let’s reunite the Young Justice crew, DC, come on. I promise to buy that book! Talking Point: Comic books are very dramatic, and there have been so many “wars”. Flash War, Kree-Skrull War, Infinity War, War of the Green Lanterns, and on and on. What is your favorite comic book “War”? The art by Howard Porter is a a lot of fun, and the story isn’t bad, but it could be about any two characters; nothing here screams out to me “Barry and Wally”, at least not in the senses that I have come to know them. The jury is out on the introduction of more Forces, but for now, they seem underwhelming and shoe-horned in. You could say they feel… “forced”.